Home Other Racing Follow along with the Rolex 24 2017. The 55th running of the Rolex 24 from Daytona International Speedway is only a couple of hours away – This is how you can follow along at home. In the USA, the race is live on the FOX Sports family of channels. The opening hours are on the main FOX network. Alternatively FSGO has lights to flag coverage with FS1 authentication according to IMSA’s website. Coverage is set to start at 2PM ET on FOX. TV coverage elsewhere – IMSA.com live streaming, MotorsTV also have coverage in the UK. 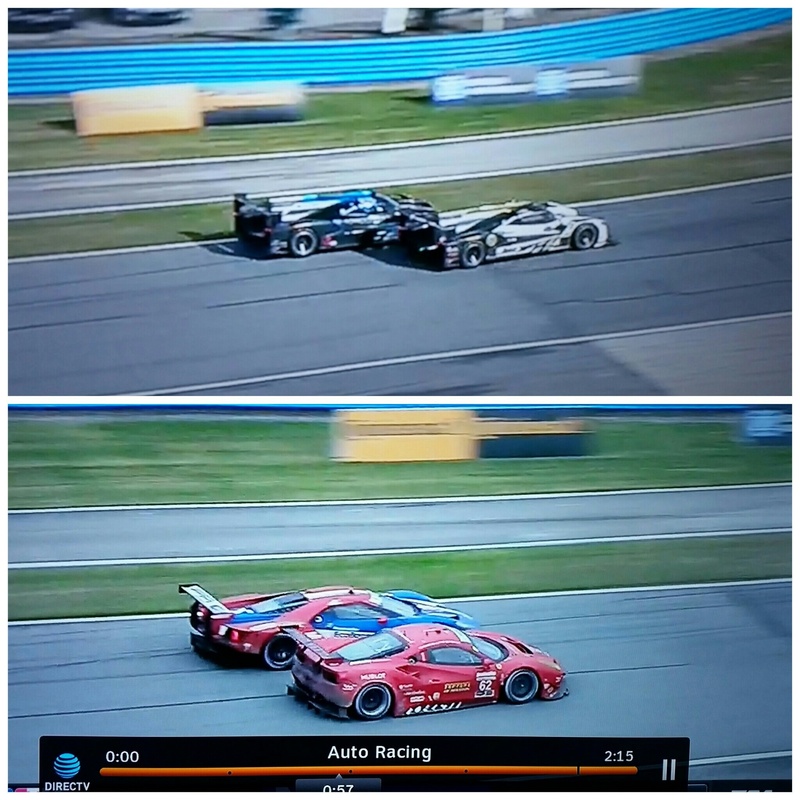 IMSA Radio audio accessible everywhere. Also please do check out IMSA’s app. The ‘P’ prototype remains the premier class in the IMSA Weathertech sportscar championship. This year the class is made up of Daytona Prototype International (DPI) entrants and the LMP2 2017 cars. Basically the difference between them is the DPI cars from Cadillac (Based on the LMP2 2017 Dallara) Mazda (Based on the LMP2 2017 Riley-Multimatic) and ESM Nissan (Based on the LMP2 2017 Ligier) have manufacturer specific bodywork affixed to one of the four LMP2 2017 chosen chassis constructors. Currently no OEM has developed a DPI package for the Oreca 07, although the base LMP2 2017 Oreca’s are represented on the grid. The other difference is that the DPI cars have engines developed by their individual manufacturers, whereas the LMP2 2017 cars all run a spec Gibson 4.2l V8 unit. All of the cars in the class are performance balanced. PC is the FLM09 spec cars, which are expected to be retired at the end of the current season. The GT LM cars share technical regulations with the GTE PRO class in WEC and the 24 Hours of Le Mans, so those should be familiar to anyone who follows Le Mans. The GTD class features GT3 specification cars, with some technical specifications for IMSA competition. These are the type of cars you would see racing at the Spa 24 Hours, and other GT3 events around the world. I’ll be here throughout the race, so if anyone has any questions or wants to discuss the race, post your comment below and I’ll try to answer it. So, who are the favorites this year (overall and per class)? The Rolex 24 . . . what a way to kick off a new season of racing! Jeff Gordon ran into it, didn’t damage Gordon’s car but light/medium contact to the Mazda. Then the rear brake lights failed and they had to replace the whole rear panel, the clutch broke and finally the gearbox is broken. New Mazda is pretty but still unreliable. The other one became a toasty mess. Slowly being creeping up then the issues for the #31 and the #22 have assisted. It’s also got Rast behind the wheel who is brilliant in these conditions. The Cadillac DPI’s are hugely successful though, BOP complaints to come! At this rate the BoP will be they have to run a 2013 spec Corvette DP. The 70 is back, all the prototypes are up and running. I wonder what the guys in the PC cars are thinking right now. Probably I wish we had a roof, followed by lots of words i can’t type. They had to let us run one more year. Why couldn’t we have LMP3 already! Would a fiberglass boat pass tech? ….and Angelelli (sp?) retires. I hear he had a great carreer. Yes he announced his retirement last week. Max the Axe has had a great career. So how exactly was Porsche allowed to compete in the series with a mid-engine 911 knowing that there’s no such thing to be found at my Porsche dealership? Well that was a bit controversial. Watching the replay back several times, I don’t know where Taylor was meant to go, except for into Alberquerque. That’s my view though, what’s yours? Hmmm, he wasn’t as far up beside him as the #66 Ford was on the #62 Ferrari earlier. I lean towards he should have yielded the spot, but I prefer them doing nothing rather than accessing a time penalty post race.